Vertical Worship is a posture. 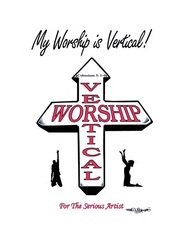 Vertical Worship is a lifestyle. As God's Creative Artists, we are called out to create the atmosphere of worship in which the Lord can move on the hearts of men. Unfortunately, many of us are just as distracted as the ones we were commissioned to lead into worship! We are designed to motivate and equip God's Creative Artist to redirect their FOCUS upward towards Jesus Christ and develop a passion and a thirst for a deeper level of intimacy with HIM like we have never experienced before! Psalmists, Dancers, Musicians, Actors, Poets, Visual Artists, Writers, Painters, Mime Ministry, Flag Ministry, Banner Ministry, Tambourine Ministry, Sign Ministry, Media Ministry, Photography and Sound Technicians. Winning the Lost thru our Art!